The story of Denmark’s Aquarium begins on Christmas Eve, 1934. Engineer Knud Højgaard and his zoologist son, Mogens Højgaard, take their annual walk through the wood. The son, Mogens, talks about how he dreams of building a hothouse for amphibians and fish, that is if he owned the wood. Five years later, in 1939, Denmark’s Aquarium opens its doors. The first public aquarium in Denmark – which in 1939 is also the second-largest in Europe – is a huge draw. In one month, nearly 77,000 people visited the aquarium. The crowds are so great that the guests have to be let in in groups. And even though the aquarium has a wide corridor with four halls off to the sides, the ventilation is unfortunately so poor that a number of guests faint. World War II breaks out in Denmark’s Aquarium’s opening year. The war makes it impossible to import fish. They still manage to keep the aquarium supplied with animals, but with less variety. In summer 1944, during the war, a general strike breaks out in Denmark. This is a disaster for Denmark’s Aquarium as it means that there is no electricity for the tanks. With Director Mogens Højgaard leading the way, the staff use pedal power to supply the tanks with oxygen. In 1974, renovations are needed, and two new sections are opened. Now, guests have access to five impressive new landscape aquariums and a biology museum. More than a decade later, in 1989, Denmark’s Aquarium celebrates its 50th anniversary. In honour of the event, the foundation Knud Højgaards Fond donates an extension to the aquarium to house a café. The café opens the following year. As the years pass, new extensions are added. However, Denmark’s Aquarium continues to outgrow its premises in Charlottenlund. By the mid-1990s, more space and modern facilities are needed. However, the aquarium is situated on listed property, making it impossible to remain in Charlottenlund. After several years of fundraising from foundations and other sources, an architecture competition is held in 2007. A new aquarium is to be built, and the Municipality of Tårnby on the little island of Amager, near Copenhagen, makes a beachfront property available to the project. The Danish firm of architects, 3XN, win the international architecture competition. 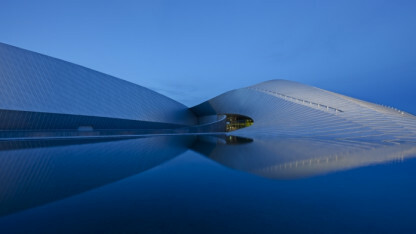 The new National Aquarium Denmark – Den Blå Planet is now a reality. The animals from the old Denmark’s Aquarium in Charlottenlund move in and are joined by many more. Today, the National Aquarium Denmark houses thousands of fish and sea creatures in 53 tanks containing a total of 7 million litres of water. The architecture is inspired by a whirlpool, and even before the National Aquarium Denmark opens its doors, the building is declared ‘Denmark’s Best Lighthouse Project’ in tourism and the experience economy. In connection with the relocation from Charlottenlund, Denmark’s Aquarium changes its name to the National Aquarium Denmark – Den Blå Planet and the organisation grows from a staff of 16 to around 70 full-time equivalents. The National Aquarium Denmark – Den Blå Planet is a commercial foundation. The National Aquarium Denmark – Den Blå Planet was inaugurated by HM Queen Margrethe II and HRH Prince Henrik on 21 March 2013 and opened to the public on 22 March 2013.